MichiganHauntedHouses.com recently sat down with Rob Johnson of DarkSyde Acres Haunted House, to discuss what's new at the haunt for the 2018 Halloween Season! Located in Jonesville, this haunted attraction is sure to get your heart pounding and your blood flowing! Read below to find out what's in store for this year. What's new at DarkSyde Acres Haunted House for 2018? Do you have any new rides, attractions, or special features that Haunt Seekers should know about? Everything is BIGGER and BETTER in 2018 at DarkSyde Acres Haunted House, we've added more scares at every twist and turn and even added more ghouls and creatures to send our guests home with wet pants. We spent the better part of a year, adding new scenes and special effects to each of the 5 haunted attractions and tripled the size of the Labyrinth making it a night to remember. I cannot wait to see the reactions from our guests this year. DarkSyde ACres Haunted House was already one of the worlds Largest Haunted Houses and now we are even BIGGER! I love watching our guests walk back to their cars literally exhausted after visiting DarkSyde Acres. What differentiates DarkSyde Acres Haunted House from other local haunts in Michigan? Our size is a HUGE factor when it comes to separating our Haunted House from others, Our Interactive themed Indoor waiting area is larger than the majority of Haunted Houses in Michigan. Plus, we do things differently than most Haunted Houses, our primary goal is to entertain our guests and get as many scares in as possible in the process. We know that we cannot scare everybody, but we make it a common goal to ensure everyone leaves having a good time. How long has DarkSyde Acres Haunted House been in business? Can you tell us a bit more about DarkSyde Acres Haunted House 's history? 2018 is DarkSyde Acres Haunted Houses eleventh season. 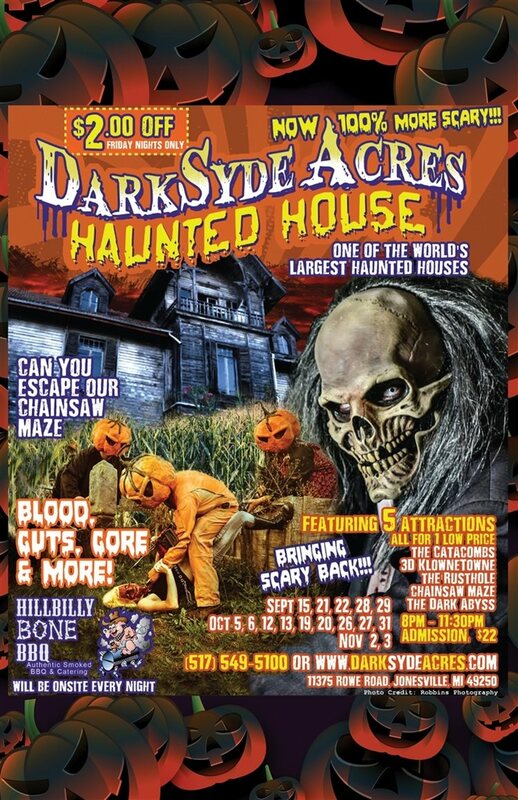 DarkSyde Acres started out as a single Haunted house and has grown every single year into one of the worlds largest Haunted Houses. What's your favorite experience since opening DarkSyde Acres Haunted House ? We switched gears from an Extreme Haunt to a more Family oriented Halloween attraction in 2016, and I have to say my favorite experience has been watching school buses and church groups and Family reunions pulling into our Parking Lot.... Makes me feel like I made the right move. How long is a typical haunt experience at DarkSyde Acres Haunted House from start to finish? It typically takes over an hour once our guests enter the first Haunted House to exit the final Haunted House, however we all know the old saying is depends on how fast you run! On a scale from 1 to 10, how scary would you say DarkSyde Acres Haunted House is? Why? Does DarkSyde Acres Haunted House 's property have any real haunted history? Do you have a spooky encounter you'd like to share? My love for all things Halloween from the time I was a toddler, I knew I wanted to do this. To share my love and Passion for Halloween with others and hopefully inspire others to do the same. How has new technology (i.e. animatronics, special props, etc) helped you to enhance DarkSyde Acres Haunted House ? We are really an old school style haunted attraction with very few High tech props, its another thing that makes DarkSyde Acres Haunted House different than most others. We don't do cookie cutter scares... By that I mean, chances are you are not going to come to DarkSyde and experience the same HOT for 2018 prop that you just seen at 3 other Haunted Houses this season. Can DarkSyde Acres Haunted House accommodate large groups? How many people can experience DarkSyde Acres Haunted House together as a group? We get bus loads in all the time of groups these days, but we try and break groups down to a manageable size, it makes for a better haunted experience when the groups are between 2-6 people. Plus, it eliminates a MOB mentality which absolutely ruins it for everybody. Does DarkSyde Acres Haunted House offer any special deals, discounts, or coupons? Anything else you'd like to let us know about DarkSyde Acres Haunted House ?